The new GLP impression S350 is the next generation of LED Moving Head Profiler, with an uniquely designed full spectrum light source, which makes primary color more intense, pastel colors more natural, and colored objects and skin-tones more lively. A comfortable optic zoom from 7°-48°provides an even and flat field with a considerable light output of up to 6.800 lm, with less than a 15% drop in output within the zoom range. But that’s not all –additionally, the compact fixture houses such cutting edge effects as an 8-facet-prism, a light and heavy frost, a tiltableanimation wheel and a fast fully closable framing system. All functions are fully capable of working in combination with one another, making the GLP impression S350 perfect for a wide range of applications. The impression S350 features GLP’s unique baseless design with full 16 bit pan and tilt movement, full range dimming, and shuttering capability. With a low weight of just 25kg / 55 lbs., the impression S350 also features an in-built battery for fixture setup, an auto sensing power supply and the option to have wireless DMX control. 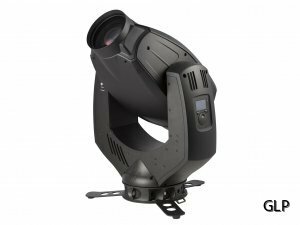 Due to this wide range of usability, the fixture is best fitting for Dry Hire and Rental companies and used in applications such as TV, Show, Musical, Theatre, Touring and Exhibitions.